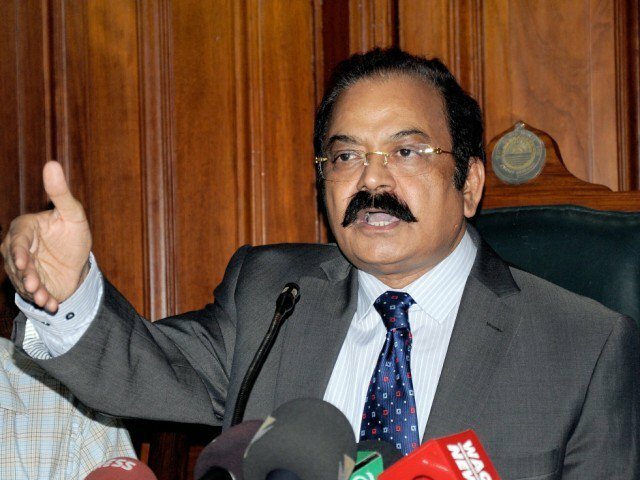 FAISALABAD: Pakistan Muslim League-Nawaz (PML-N) will make a clean sweep in the next general elections only because of the prudent policies of Nawaz Sharif, said Punjab Law Minister Rana Sanaullah Khan on Monday. He was talking to reporters before inaugurating a painting exhibition and addressing another function of special children at Faisalabad Arts Council (FAC). He said that people of Pakistan, as well as workers and leaders of the PML-N, were with Nawaz Sharif as he had the vision of national progress and prosperity. He said that Pakistan Tehreek-e-Insaf (PTI) Chairman Imran Khan and Sheikh Rasheed had been dejected due to popularity of the PML-N and, in sheer dejection, they might carry out a ‘suicide attack’ on the political system of the country. Therefore, a vigilant eye should be kept on them. The minister said that the Supreme Court should impose a ban on the entry of Sheikh Rasheed in the apex court premises as his remarks were defaming the courts. He said though Nawaz Sharif was disqualified in Pakistan, yet his role is admitted at the global level. Political pundits should avoid spreading rumours regarding visit of Nawaz Sharif and Chief Minister Shehbaz Sharif to Saudi Arabia as the Sharif brothers paid a visit for creating ‘harmony’ among the Muslim countries and for solution to the problems being faced by the Muslim nationhood. Responding to a question about Model Town incident, the minister said that all nominated persons ensured their presence before the Joint Investigation Team (JIT). Out of them, some were exonerated and some were declared guilty, who were now being tried in the court. The objective behind sit-ins and lockdowns is to destabilise the country politically as well as economically, the minister said, adding that Pakistan Awami Tehreek (PAT) should pursue its case in the court and avoid staging sit-ins and lockdowns. To another question, he said that the increase in petroleum prices was an outcome of high petroleum rates in the international markets. “We will decrease prices as soon as the rates come down in the international market,” he added. The minister also appreciated Faisalabad Police and said that due to its excellent performance, law and order situation had witnessed improvement and a sufficient decrease was observed in street crimes in the industrial capital.